Athletes who continue to suffer pain and loss of knee function from patellar tendinopathy can benefit from surgery. Significant pain relief and return to full sports participation is possible. These are the reported results from a recent European study. Sixty-four patients with patellar tendinopathy who did not get relief from their symptoms with conservative (nonoperative) care were included in the study. Alignment or overuse problems of the knee structures is a common problem among athletes. Strain, irritation, and/or injury of the patellar tendon often produce pain, weakness, and swelling of the knee joint. 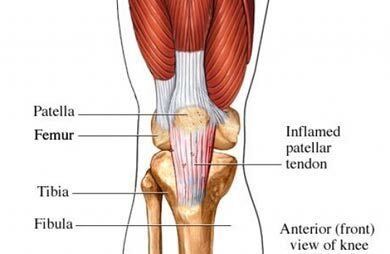 In the acute form of this problem, patellar tendonitis (also known as jumper’s knee) develops. When the condition goes on for more than three months (six months at the outside), it is considered a chronic problem. In the chronic phase of this condition, microtears in the tendon have failed to heal. Instead, poor blood supply leads to changes observed in the tendon-bone interface as well as in the fibrocartilage of the patella (knee cap). Ultrasound studies have also shown the formation of cyst-like cavities where the tendon attaches to the bone. Knee pain and tenderness where the patellar tendon attaches to the bottom of the patella (knee cap) is the most common symptom. It is usually activity-related (i.e., occurs with movement especially running, repeated jumping and landing, and kicking). Nonoperative care is the first-line of treatment for this problem. The best approach (one that works for everyone every time) remains uncertain. Instead, the patient tries activity modification, rest, anti inflammatory medications, exercises, cold therapy, steroid injections, deep friction massage, or some combination of these approaches. When conservative care fails to improve things, the athlete may be directed to a surgical solution. The first decision regarding surgical treatment is whether the procedure should be done arthroscopically or with an open incision. 64 athletes were treated arthroscopically by one surgeon. One-third of the group was involved in professional sports (soccer, basketball, and volleyball). Those athletes involved in recreational sports were also engaged in jogging and tennis. The technique used was debridement (shaving or clearing away) of abnormal tissue and removal of the lower pole (portion) of the patella. In particular, the surgeon removed an area of fat called the Hoffa fat pad. This layer of adipose (fat) tissue is located behind the patellar tendon. That’s the area where there is the most loss of blood flow. Shaving this tissue away helps stimulate a more natural healing process. Before and after surgery results were compared using pain, knee motion, and knee function as outcome measures. Specific tests used to assess the results included the International Knee Documentation Committee (IKDC), Lysholm score, and Victorian Institute of Sport Assessment-Patella (VISA-P). Despite concerns that arthroscopic surgery for patellar tendinopathy might not be the ideal choice, the majority of these patients had excellent mid-term and long-term results. Before and after testing showed significant improvements that lasted at least three years. Some of the patients were followed for up to 10 years with the same continued good results. Best of all, half of the professional players were able to return to full sports play within three months of the surgery and there were no complications for anyone enrolled in the study. For those who were either unable to return so quickly or who still had ongoing pain might have gotten better results with open surgery. The open procedure gives the surgeon a better look in order to determine all areas of abnormalities requiring treatment. Determining who would respond well to arthroscopic surgery and who is going to need an open approach is your doctors decision. For now we know there are, indeed, many athletes who will respond well to arthroscopic treatment of chronic tendinopathy. Their return to full sports action in a short period of time is proof of that.